Do you like winter sports as I do? I really hope so :) Because of that and because the winter is already here I would like to tell you a Sofia local secret. And this time is not about good places for skiing, but probably the best place with the cheapest ski and snowboard equipment I know in Bulgaria. As you know the winter sports equipment is quite expensive everywhere. If you have those money is not gonna be a problem to dress up for the tracks, but for most of young Bulgarians is more difficult to do it with humble means. There is only one place which make their winter fairytale possible. 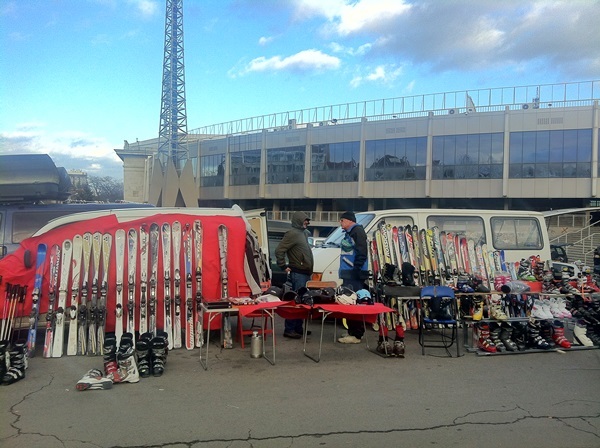 The place is the traditional winter second hand and outlet market for skiing and snowboarding in front of the National Stadium “Vasil Levski” in Sofia, open only during the weekends. There enthusiasts who want to purchase ski, snowboards, boots, poles, bindings, clothing, eyewear and other gear can make it relatively affordable. Among the goods which are sold you could find good suggestions. Except the traders, there are also amateurs who want to sell their old skis, this allows for price negotiations. So if you desire to be equipped with good and cheap equipment and you have no problems with that you must return it at home i suggest to spend a few hours over the weekend and take a walk around the National Stadium in Sofia. Skiers can find everything needed for winter sports – ski boots, jackets, gloves, bindings, mountain shoes, socks, glasses and more. Most of the accessories are second hand but are new products, at a price almost halfway down compared to those in stores. The variety of models and brands help the people decided to spend their ski holiday in Bulgaria to choose the most appropriate equipment for them. The market offers both carving and classic type of skis second hand. The Set with poles, boots and skis second hand can be found for 30-60 euros. Not that bad huh. Second hand carving patterns cost an average of 60 euros included boots and poles out to 120 euros. Old poles can be founded for around 10 €. For sure more cheaper even than those at second-hand stores. The price of new equipment is also attractive. For average cost of 80 – 130 euros you can buy a new pair of skis. Carving ski “Orion” are between 70 – 90 euros and “Rossignol” between 80 and 100 euros. Pair of new ski boots “Solomon” running around 60 – 90 euros. There are even cheaper not as well-known brands. So for about 150 – 200 euros you can buy new skis, ski boots and ski poles. I think you not gonna find any offer like this in Bulgaria neither in Europe. Snowboarders can also be fully equipped before their snowboard adventure in Bulgaria. Second hand boards running on 40 – 60 euros and the shoes are available in 25-30 euros. The new boards can be founded for around 90 euros. For those who do not ski or snowboard, the market offers sleigh rides, mini skis, ice skates and mountain gear. Except to sell their skis, Bulgarians also bring their old ski equipment on the market to repair them. So don’t be scared to make deals with Bulgarians at that ski market. You can find good offers for yourselves, and if you don’t is not necessary to buy anything. Just have a walk and make some good pictures :) And remember something – The second hand ski market in Sofia is open only on Saturday and Sunday. Travel Bulgaria Like a Local! The Cheapest Market in Sofia.